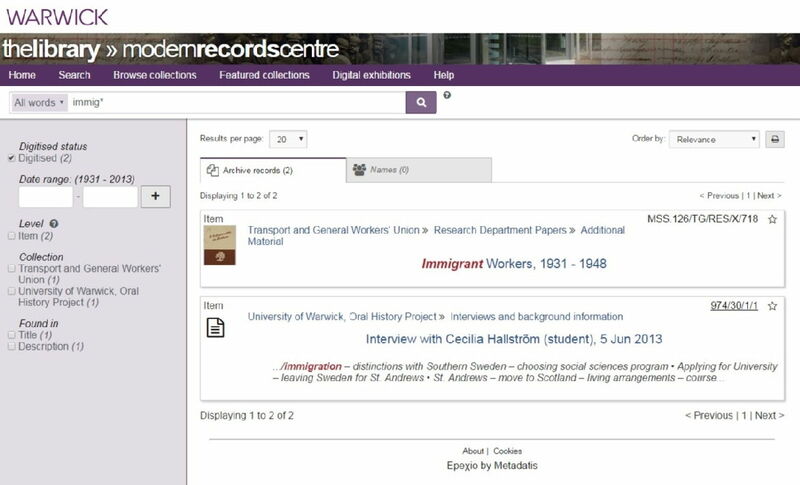 The Modern Records Centre catalogue is separate from that of the University of Warwick Library and functions in a different way - you can find our online catalogue at http://mrc-catalogue.warwick.ac.uk (it contains more than 300,000 entries). Every document in every file is not individually catalogued - with archives boxed up on 14 kilometres of shelving we have too much material to be able to physically do this. Many catalogue descriptions will therefore be a general and often brief overview of the contents of a file or volume, sometimes giving just the title and the covering dates. Some digital content is available via the catalogue as a digital file but for the majority of our born digital collections you will need to get in touch with us in advance regarding access to them. The MRC catalogue will search for a keyword or phrase in all fields, including title, author and description. So, for instance, searching for the word ‘immigration’ will bring up all hits with the word ‘immigration’ in the title of a document, the description of the document or (less likely in this example) the name of the author. The field is not case-sensitive. If you enter more than one word, the catalogue will automatically perform a Boolean search using the 'AND' command - in translation, this means that if you search for the two words ‘trade union’, the catalogue will bring you results where both words appear somewhere in the entry (although not necessarily next to each other), unless you actively choose an alternative method of searching. If you would prefer to search for an exact phrase or for any of the words entered (rather than all), you can change the default search accordingly on either the catalogue home page (click on 'search options') or the search bar at the top of the results page (choose the click down options to the left of the search box). Put a phrase in quotation marks to find results containing that exact phrase e.g. "trades union congress"
When searching, think laterally and try several different terms (e.g. health/disease*/medic* for medicine, medical etc). Please be aware that modern terms may not find the topics you are looking for - much of the material that we hold is from the early or mid 20th century when different terminology was widely used, some of which may be regarded as controversial or offensive now. This can apply, for example, to documents relating to health and disability, race and ethnicity, and to documents about countries which have changed their names (e.g. Sri Lanka was formerly Ceylon). Some terms will produce a large number of hits - for example, if you are interested in post-Second World War immigration to Britain, a basic search for immig* (i.e. to include immigration, immigrant, immigrants, etc.) will find over 450 hits. You can also limit a search by date range. 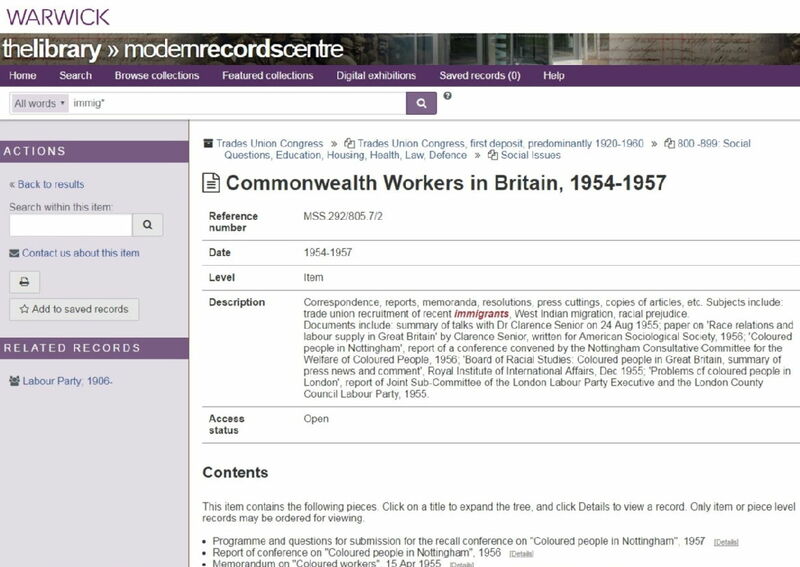 So if you want to explore documents relating to immigration to Britain after the arrival of the Empire Windrush, you might search within the date range of 1948 to 1962. As shown below, this would reduce your search (at time of writing) to 79 hits. 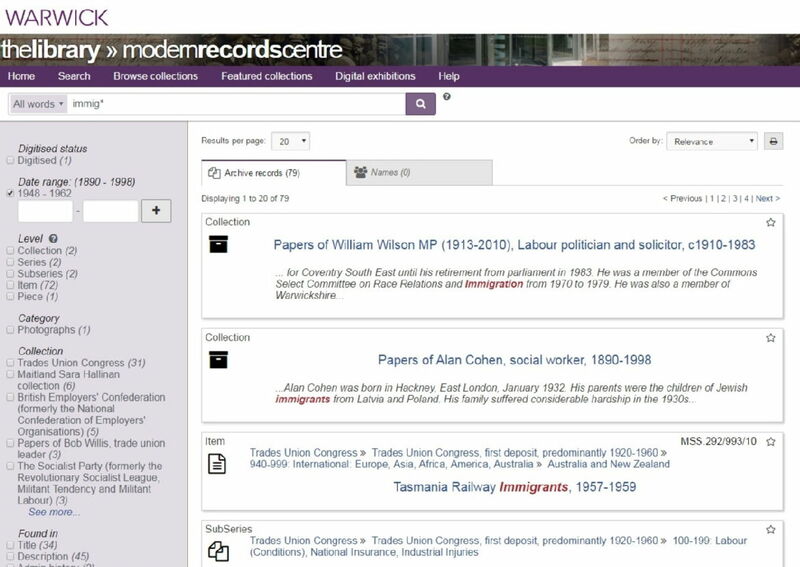 You can further limit your search by choosing results where the search term just appears in the title, or by selecting results from a particular archive collection (for example that of the Trades Union Congress or British Employers' Confederation). 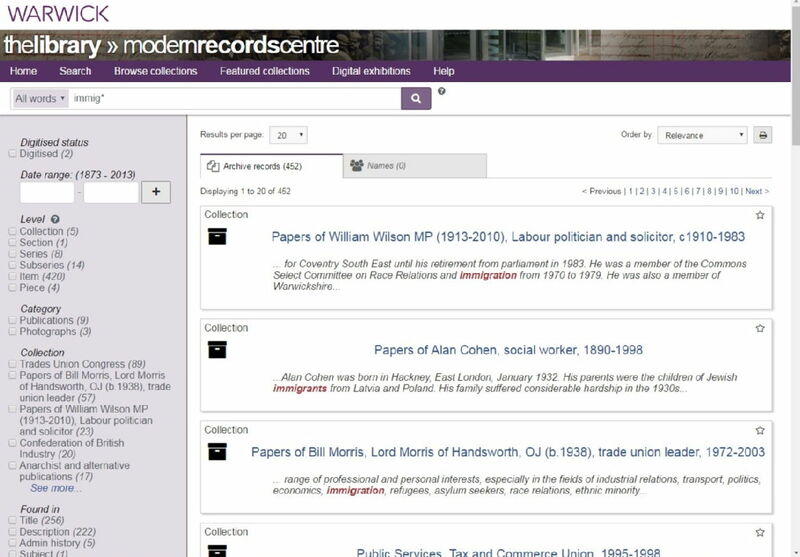 As well as searching for keywords, it is also possible to browse within particular archive collections. This can help you to find documents on a similar subject or theme which have been filed together. You can click on the + or -, the highlighted text, or the [Details] links to find out more about what the collection contains. In this particular case, the text at the top tells us that the copies of the 'Vietnam Bulletin' are included in papers of Jack Askins about the Anti-Vietnam War Movement, and are in a series of documents relating to the British anti-Vietnam War movement. By clicking on 'Documents relating to the British anti-Vietnam War movement', you can see what else is listed in this section. If you want to save a list of potentially relevant documents, click on the option to 'Add to saved records' on the left side of the screen. You can then view your list by clicking on 'Saved records' on the toolbar at the top. The catalogue entry will provide you with one key piece of information - the reference number (a code which usually starts with "MSS"). This is what you will need to supply to order the item. Make sure that you record the reference number when you are making notes or copying the document too - you will need to include the reference number when citing the documents in your work. There are several ways to order a document to view in our search room. You can click the link in the left hand bar of the catalogue ‘Contact us about this item’ to request the item ahead of a visit (ideally at least one full working day in advance). Once you have the reference number, you can also send us an email to request the document in advance of your visit. Alternatively, you can visit the archives and fill out a document request form - we can usually get it out for you within 15 minutes.